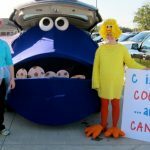 Scavenger Hunt Ideas - C.R.A.F.T. Andy’s birthday is November 7th, and I got him tickets to a show that played in Austin on Oct. 8th. I didn’t just want to hand him the tickets, so I decided to do a little birthday scavenger hunt action. My mom used to do these for us when we were kids. 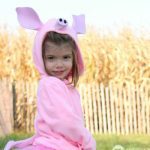 So I can vouch for the awesome of these scavenger hunt ideas for kids and adults! I’m not going to lie, I’m pretty excited to keep the tradition alive! 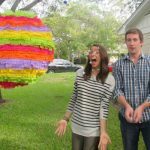 I put together a birthday scavenger hunt for a friend awhile back when the blog was just a baby. 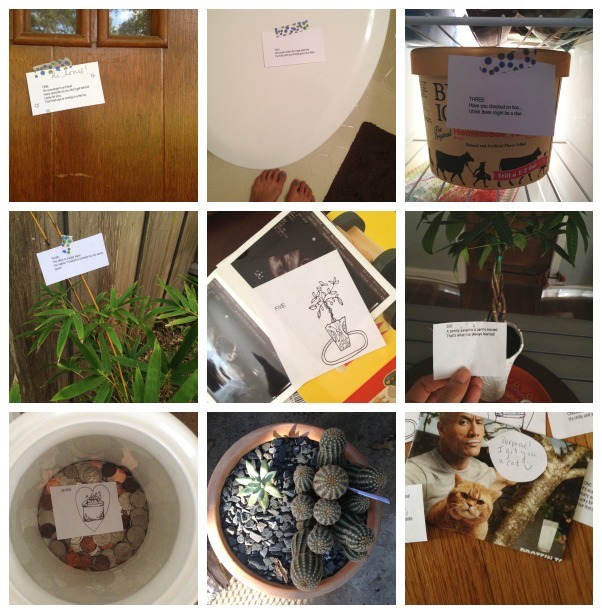 Scavenger hunts are creative ways to give a gift or gifts to anyone! My mama used to do a very similar thing with us but instead of rhyming clues, she drew super simple pictures as to where the next clue was hiding. 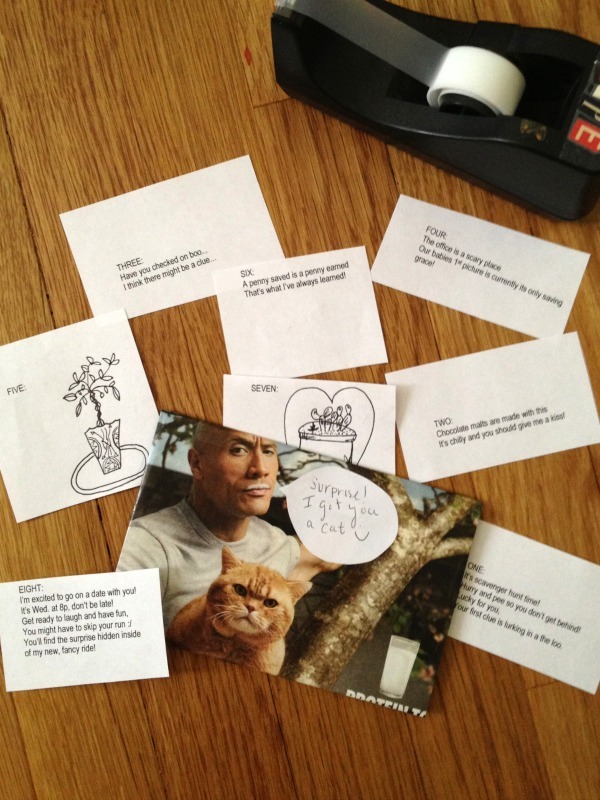 Here are the 8 clues I crafted up for Andy. Many are inside jokes, and 2 are drawings. I like to make him run all over the house and even outside. Here is what goes into the planning. I write up the clues in a word doc and try to make them fit on one sheet. Then, print out the clue sheet. The tickets are in a little magazine envelope I made. On a side note, he did not find the “Surprise! I got you a cat” note funny. I think he really thought I got him a cat, ha! Then on the back of printed out clue sheet, write where each clue should be hidden. This will cut your clue hiding time in half! Next, cut the clues and hide ’em where they go. Make sure and leave the first on out to hand to the hunter. Just a little warning, I’m so bad at editing videos. But, here’s a 1:20 minute clip of Andy doing his birthday scavenger hunt and me giggling. And here are all 8 clues hidden and ready to be hunted. 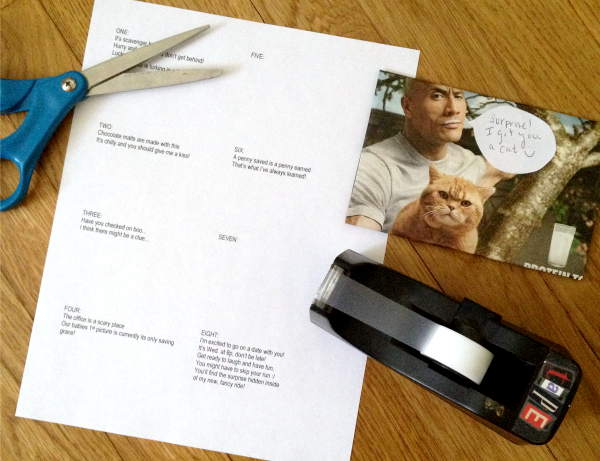 I used washi tape to attach most of the clues. It’s cute and doesn’t mess things up. The first clue is taped to the front door for him to see when he gets home from work, which led him to the toilet, to the freezer, to the bamboo, to the sonogram picture, to the money tree, the change jar, to a cactus plant, and then to grand prize which was hidden in my car! 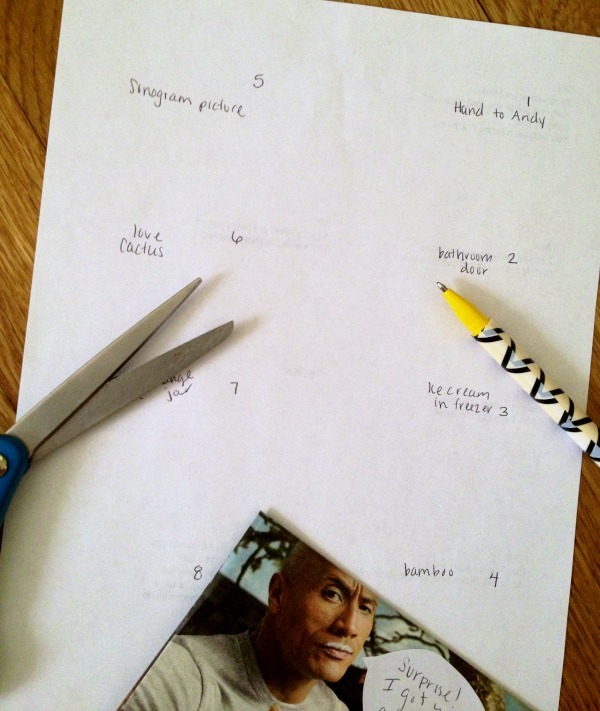 Have you ever made clue games for family or friends birthdays? 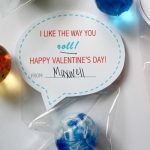 It’s easy and fun and seriously makes even the smallest of gifts way more fun to give and receive! Omg his expression when he sees the tickets is the cutest thing i have ever seen! The easter bunny hides my kids baskets and leaves clues so they can find it. They love that. This year for Christmas we got my daughter tickets to see Imagine Dragons in Toronto, ON (side note, my hubby was SUPPOSE to buy tickets for the Montreal concert, which is a 90 minute drive, but somehow when with Toronto… a 7 hour drive). We’re making it a four day trip where she’ll drive down with my hubby, visit the aquarium, see the concert and do a little shopping. I’m doing a gift-type scavenger hunt where each gift will give her a clue to what she is receiving. Can’t wait to see her face on Christmas morning! I love the hidden Easter basket idea!! How fun is that! And what a lucky daughter… a vacation and a concert for Christmas! Going to Disney World in an hour?!! That is SOOOO awesome. What a fun mama! I do this every year for my daughter and my nephews. We have a slumber party, “just because” with a “treasure hunt” and they look forward to it every year. I give them clues and in the clues I even have them do different activities (i.e. hop on one foot, walk backwards, sing a song, etc.). It is SO much fun watching them. Then when they get to the end there’s a “treasure” waiting for them with little trinkets. It’s amazing how the end product isn’t even that important to them. They enjoy the “game” itself far more. This was such a great post!!! You are absolutely right . . . any gift/message/game is far more fun if there’s a “hunt” involved!!! Thanks! 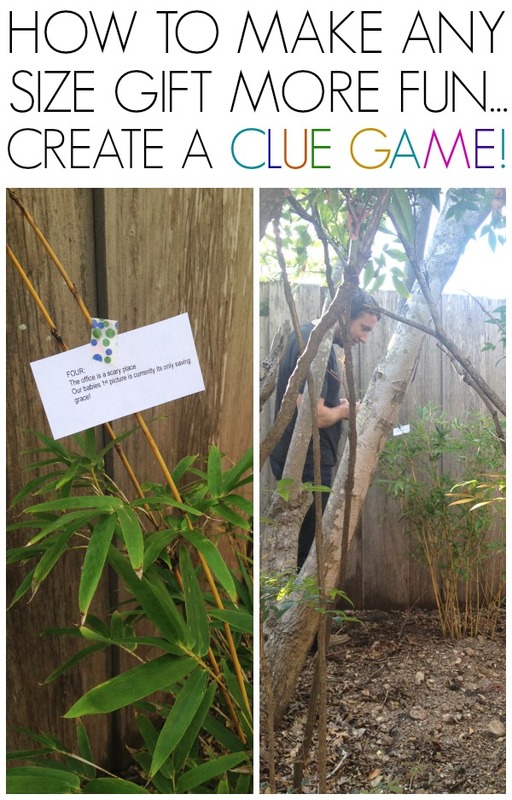 I love the ideas of adding activities to the clues… fun! Thanks for sharing!